Thanks to all contributors to this topic. Thought I would add a pic to the thread of a bushing filled with the silicone. Anyone else have issues trying to break the bolts free from the steering wheel. My 98' bolts will not budge and im afraid to break em. Any thoughts? BTW.. Im talking about the torx bolts holding the horn to the wheel.. Mine were super tight too. Keep at it. I used a "L" torx and clamped on a vice grip for additional leverage. There is blue loctite on the threads. So it does take effort to break them free. Removed a few air bags over the years. Finally bought the long T30 bit for my ratchet wrench that is on the far right. Also, you unscrew the screws in the normal counter-clockwise direction like removing a lid from a jar. So keep this orientation in mind as you will be working "backwards." If you are using the long screwdriver type then rotate the wheel so that the hole faces your legs so that there is clearance to rotate the tool. When all I had was the screwdriver type I would have to put a crescent wrench on the square handle to get enough torque, like in the left of the pic. 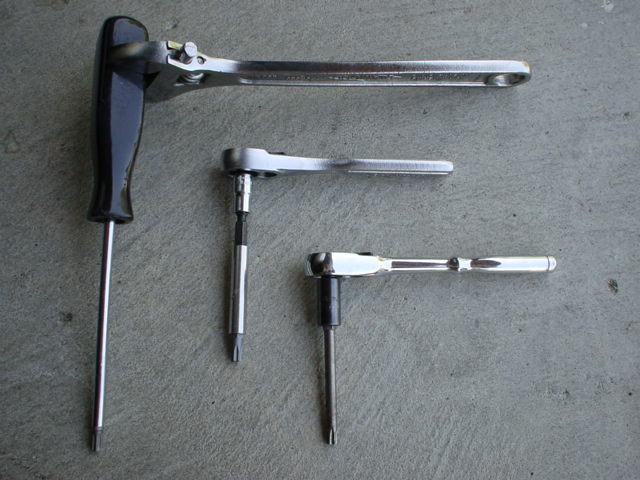 If you have a round handle screwdriver type, I hope you have a strong hand grip or you will have to use channellocks or vice grips on the handle to break the screws free of the loctite. Also, the screws are on a slight angle. When you stick your tool into the hole in the back of the wheel your tool needs to be at an angle. There is loctite on the threads. This is why the internet is the best thing ever invented! Thanks folks. Anyway, I had worked out my problem for some time this way ... take a business card, cut into half and keep folding till it becomes a 1/2" long thick stub. Wind it once with scotch tape (to prevent unfolding..) and use a black permanent marker to make the whole thing black. Now wedge it in the top edge between the horn piece and the rest of the steering wheel - instant spacer ! This way you'll have the horn for emergencies - and it doesn't look very weird (the black blends with the steering wheel). Plus it buys you a few days to work on it when you get the time. Simple grandmother-style fix - but just mentioning this to complete this thread. Anyways since then I've become much better at DIY's !! Did my own cooling tank replacement, own console mods, own muffler mods and installations. Knowledge is power ... and fun ! Fixed the horn now the airbag light is on. Does this have to be reset with an OBDII computer? When you put the key in the ignition switch it activated the air bag circuit (without turning it). You will need the Durametric Software, a PST2 or PIWIS tester to turn the air bag light off. Yes i did have the key in the ignition only to be able to turn the steering wheel to get at the bolts. So when i go to Discount Auto Parts they have an Actron computer that i plug in to look at codes. Is this one of the above that you were talking about? Unless the Actron has changed it can not turn off air bag codes. Where are you located? Perhaps someone close has tool to clear it for you. Mobil 0w40 for $.50 off a quart. So it is $5.48 a quart. That is cheap for here....Daytona Beach Florida. Closest Porsche Dealership is in Orlando or Brumos in Jacksonville. 1) Put steering wheel in a position to access torx bolts (not a easy task, I might add). 2) Put key in ignition, but do not actuate (this is a question)? As I understand, this is to keep the air bag light from coming on. Now I'm ready to follow you guys very specific instructions to repair bushing? Does this sound correct? I would reverse step 2 and 3. The key activates the airbag circuit - even when the car is off. So, you want to disconnect the battery first. If the key is turned on with the air bag disconnected you get the warning light. Most people need to have the key turned on in order to rotate the steering wheel in order to get to the torx screws for the air bag. Then when they disconnect the air bag electrical connector with the key still on the warning light goes on. Keep it simple and disconnect the negative battery cable before you start. Then you can turn the ignition on, rotate the wheel, and disconnect the air bag. After everything is back together then hook up the battery. Do not forget to put the yellow connector back on the air bag. A tip. The air bag is heavy. As you unscrew the 2 torx screws use your other hand to hold the air bag in place against the steering wheel. You do not want the air bag to fall out as the last screw is removed. You do not want the air bag to hange from the conntector. WOW! Thanks guys, this helped me a ton this afternoon! I just wanted to add three things I ran into. #1 I choose the school of hi-temp silicone, I only filled in the front side of the rubber rings. After it dried out I put it in, and realized it wasn't enough! <_< So I had to take it out and put some on the other side also.. All said and done the horn is allot stiffer to get a squeak out of it, but it's not going off anymore coming to a stop!! #2 I disconnected my negative battery lead and let it power down for 30 mins.. By doing so I reset my stereo! So its asking for a code to reactivate it.. So be warned! make sure you have your code card before disconnecting your battery. Seeing how I lost that card, Ill have to buy a new after market stereo. I know you can look up the code and or go to your dealer, but I was looking for a wife excuse for getting a new sound system ;) . Besides the stock 220 Becker unit is junk and Ill be better off with an Alpine or Kenwood deck). #3 Windows! make sure your windows are down, when you have no battery hooked up you have no power. That means they won't go automatically up and down that inch to avoid the lip. Also when I hooked everything back up my one touch window feature wasn't working. Make sure you hold down the button for each window for 10 seconds in each direction. Do this even after the window is completely open or closed.. it will reset the one touch feature. Gotta love it, lethargy is the mother of invention in my book. I bought my high temp silicone this morning. 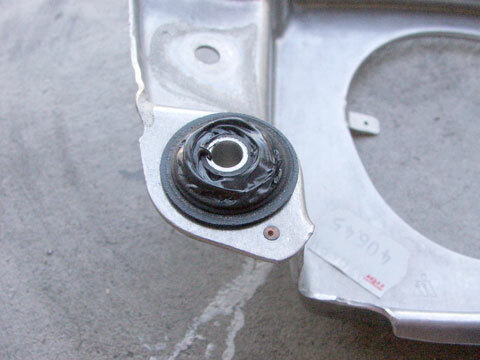 Did you use any sort of temporary shims to wedge between the plate and the nuts/ washers to hold the assembled parts in position (separating the horn circuit contacts) while the silicone set up? Mines pretty bad. Started sounding off by hitting the brakes to hard, ended when it just went started going on & off while parked, Current fix is a stick wedged between the airbag and the steering wheel, says to me I need to wedge those bolts out somehow. Also, did you take the plate off or could you squeeze the goop in from behind. O.K. did my adaptation of the silicone fix. My original bushings weren’t to bad, but bad enough to be an embarrassment. Difference in my attack is that I applied the silicon primarily to the back of the bushings and put the bolts back in finger tight, over night. Proved to be too stiff in the bottom corners. So I pulled the plate off and shaved the silicone down a bit with a sharp utility blade, works fine now. Bit stiff but its better than being flipped off all the time. One tidbit, if your reading this out off desperation, those T30 torx head bolts need to be installed in the back of the metal plate before you put said plate in place and bolt it down. These bolts will not go threw the hole you but your torx drive through. I attempted the fix but only made it partially better. I am about the apply more silicone as my guess is that I didn't apply it thick enough. My question is as follows: does the tightness of the bolts that secure the bracket to the back of the streering wheel matter? When I took the plate off originally they were not tightened down all the way from the factory. How tight should they be when I reinstall? As tight as possible?